This is Part III of The Scale Series, which explores how brands scale—successfully and unsuccessfully—in the fashion industry. Read Part I and Part II if you haven’t yet. In Part II we looked at brands that have overscaled their promise. Now, we’ll examine successful fashion brands that have balanced their creative and commercial aspirations over the long term, which allows the strength of a brand to compound. Supreme is one of the best examples of a brand that has always kept its promise while scaling. The brand, founded in New York in 1994 by James Jebbia as a haven for skaters, started as a retail store. Instead of releasing its collection all at once, Supreme released its products in weekly drops at 11am every Thursday, where only a handful of products would be available. “It drips out continuously, like morphine through an IV,” as Racked put it. These modular releases define the brand as much, if not more, than its iconic logo. The results of this method have led Supreme to become what many have called “the most influential streetwear brand in the world” over and over again, surpassing all of its peers. Luxury brands also use the visibility of a few iconic, expensive products to create a sense of prestige for their real money-makers, cheaper accessories like sunglasses or lipstick. Streetwear adopts a similar scheme, though rarity subs in for high price points to produce exclusivity. Allowing customers to buy into the brand is the important part — you can start with a $6 Supreme sticker and graduate to an $800 fur coat. Once you’re in, there’s no end to the collectible depth. Scarcity is the tool of choice for ultra-luxury brands, but Supreme redefined it. Jebbia has said that this is entirely—and obviously—by design. “If we can sell 600, I make 400,” he told Interview magazine in 2009. Supreme follows the same trajectory of most fashion brands by offering familiar products that make all of the money (known as core products) and then highly exclusive products that drive the brand (known as seasonal products). Supreme’s products are never super expensive directly from the company, but there is a voracious secondary market where prices often skyrocket. The company’s decision to capture no revenue from the secondary market might be one of the better contrarian moves: although Supreme loses millions of dollars by having no stake in this market, the fervor over its products repeatedly solidifies the brand, which then translates back into customers using core products to enter the brand and then work their way up to the rarer items. The brand’s disinterest in finding price elasticity is arguably what made it a cult, thus driving even more sales. While it’s challenging to create scarcity while also keeping prices low, the benefits can be profound: Supreme is ubiquitous but not overexposed. The box logo is instantly recognizable because of its ever-present repetition but it still carries meaning. This logo is printed on a litany of products, from apparel to bags to lighters to hammers to axes. Supreme is everywhere, yet still potent. The brand itself is quite lean for a company with a rumored $100 million in revenue. It has only ten retail stores (most of which are in Japan, where the brand has a massive following) and around fifty employees. It shuns wholesale, minus a few exclusive locations such as Dover Street Market. Throughout all of this, while the brand has grown too big for some purists, it has remained mostly intact. Some attribute this to Supreme’s continued participation in skate culture, which is where it started. Rick Owens, more so than any designer out there, built and scaled not just his own brand, but his own universe. He trained as a pattern maker in Los Angeles and then went on to design both knock-off and designer fashion. He created his first collection in 1994. Owens began working under and then dating Michele Lamy, known as the best patternmaker in LA, who turned into his frequent collaborator. In 2002, Vogue funded a show for him at New York Fashion Week and Owens sold his line exclusively at Charles Galley, an experimental boutique in LA. The same year, the CFDA awarded Owens an award as an emerging designer and Révillon, the long-time furrier, hired him as creative director, which brought Owens and Lamy to France. In 2004, with his brand well underway, Owens partnered with his manufacturers in San Giacomo, Italy, who took over much of the business and production side, freeing Owens to work on everything else. “The Italians,” as Owens calls them, own 20% of the business while Lamy and Owens retain the rest. Shortly after, he slowly expanded his stocklist to include other high-end boutiques, such as Maxfield in LA and Brown’s in London. The degree of control Owens exerts over his namesake brand is unparalleled compared to his peers. He designs every single piece that bears his name, and calls his design process “fascist.” “I’m fine if I can have it all done my way…. But it has to all be my way” he told Business of Fashion in 2014. But it’s this degree of control that has kept Rick Owens as strong as ever. It is, by all definitions, a cult. And even as it has grown both wholesale accounts and its own stores, it remains potent. Today, Owens has nine stores, hundreds of wholesale accounts, as well as DRKSHDW, his secondary line. Some call this a diffusion line, which oversimplifies that fact that DRKSHDW is really just slightly less expensive Rick Owens. The designer still designs it and it’s part of the same conversation and vision as the mainline, unlike most diffusion lines. All the while, the brand has done no traditional marketing or advertising, save whatever it takes to exist on social media today. By inking a strong partnership with his manufacturers—which is often where brands go wrong at scale—Owens has been able to grow while maintaining the quality of both the brand and its products. Since he has total control, even though outside money is involved, Owens is able to do things his way and keep the purity. 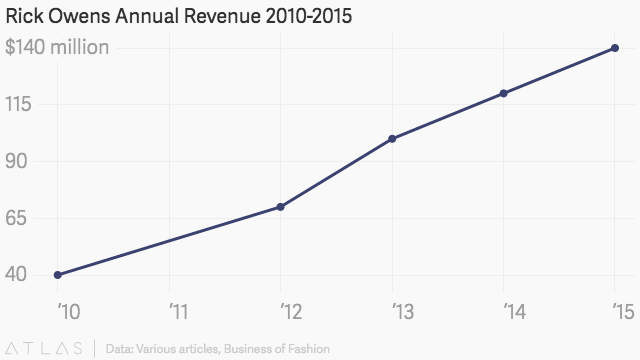 Although the brand will do probably close to $200 million this year, it remains potent as ever. A.P.C. is another brand that has been consistently strong. Founded in 1987 by Jean Touitou, an outspoken and strong-willed designer, A.P.C. was one of the earliest members of what many know today as the contemporary market. The goal, according to Touitou, was to make simple yet high quality clothing at an affordable price. This was a reaction to the heavily-branded fashion of the 1980s, along with the Swedish influences from Touitou’s upbringing. A.P.C. started with denim, as Touitou sourced a raw denim commonly found in army surplus stores and turned in into his signature pant. But in the early years, A.P.C. was not making any money. Touitou worked as a ghost designer for many other brands as he saved up money for A.P.C., and slowly brought on people to help build the brand. It opened its first store a few years later, and then opened a joint venture store in Japan, which remains its biggest market. As a result of these lean times, Touitou continues to keep a tight watch on how the brand spends money, which in turn allows it to take risks on projects that will push it forward. In the fashion industry, frankly, no-one. I would love if someone better than us could kill us. I would respect them. But it’s not happening, I’m sorry. We question ourselves so much, we work so much. Almost all our profits are reinvested in research. We will grow A.P.C. steadily, but we do not have the ambition to take over the world. I don’t feel the need to buy art or mega-yachts like other fashion houses. A.P.C.’s success is likely because of its own self awareness and boldness, which spans both the brand, the company and its confident founder. Touitou grew the brand naturally on a core set of principles and stuck to them, never letting money get in the way. A.P.C’s tagline is “Atelier de production et de création,” which simply means “production and creation workshop,” a startlingly open-ended manifesto. Yet this freedom has allowed the brand to stay focused while evolving over time. Almost 30 years later, A.P.C exists on an much bigger scale than where it started, with over 63 stores, 300 third party doors, and over $60 million in annual revenue. Denim, interestingly, only accounts for around 16% of that number. A.P.C. remains a brand that has kept its promise since day one, and Touitou owns almost all of it. The last—and most complex—successful brand worth looking at is Comme des Garçons, the Japan-based label founded by Rei Kawakubo in 1969, who owns the company along with her husband Adrian Joffe. Comme started as a women’s line, opened its first store in 1976, adding menswear in 1978 and debuting its first fashion show in 1981 in Paris. In 1982 and 1983, she opened stores in Paris and New York respectively. Browns, the famous London department store, was an early supporter, stocking the brand in 1981. Everything in the Comme world is designed. Kawakubo is often the root, but many other people contribute to the execution of this vision. This strong point of view— that is strikingly clear in the New Yorker profile, which is worth reading in full—has played a crucial role keeping the brand potent as it has scaled. Kawakubo, much like Rick Owens, has built a universe alongside a cult, which was often referred to as “the crows” early on. The purity of Kawakubo’s vision creates a powerful foundation. In 1980, Comme was sold in over 150 third-party doors, in addition to its own stores, clocking over $30 million in revenue among a handful of product lines. In 2006, the brand’s twelve different lines were sold in over 200 accounts, clocking in $150 million. And the most recent numbers available, from 2013, showed revenue of $220 million among over twenty different product lines. It’s crucial to note that Comme sells over 95% of the items Kawakubo shows on the runway, dispelling the idea that the heart of her vision is merely a branding exercise. This approach is the opposite of how a brand like Michael Kors approached brand extensions. Kors, as explored in Part II, created adjacent products by diffusing the mother brand and using traces of it. Comme, conversely, used the purity of the mother brand to extend it in different directions, but without losing the spirit—and not to mention the aesthetics—of the root. This approach is additive, not subtractive. One of the best examples is Comme des Garçons PLAY, one of the brand’s most affordable lines, which includes basics (t-shirts, sweatshirts and knits) as well as footwear (the signature collaboration with Converse). PLAY makes up 12% of the company’s revenue, but instead of simply spinning off another line, Comme created a unique identity in the form of the “bug-eyed heart logo” that is instantly recognizable. Even though Joffe admits PLAY was a “business decision,” it was extending the core of the brand, not diffusing it. The brand very smartly worked with a licensor to take away many of the production struggles for making fragrances, where expertise is generally concentrated, while keeping full creative control. Comme was able to focus on everything brand related, while Puig focused on production, a perfect partnership, akin to Rick Owens and “the Italians.” The importance of Comme retaining control over its own brand is crucial with licenses like these. This clever approach also applies to how the brand approaches markdowns. In 2004, the company launched “guerilla stores” that exist only for a year in a given city. The first one opened in Berlin, with additional ones in Barcelona, Helsinki, Singapore, Stockholm, Ljubljana and Warsaw. Comme stocked the stores with deadstock products, which were often sitting unsold in its warehouses. Interestingly, people could only spend $2,000 at a store, yet another contrarian move that limits how much someone can walk away with. Most brands would take unsold merchandise and sell it for pennies on the dollar to an outlet store, but Comme used this reality to create new experiences. This was both a wise business decision, as it allowed the brand to get rid of excess products, while also acting as a wise branding decision, furthering the mystique of the brand. Comme des Garçons remains one of the best examples of a brand succeeding at scale on its own terms. It’s owned entirely by its founders, it’s as pure as it can be, and it has grown respectfully, not recklessly. Kawakubo and Joffe have built a world that thrives as a business, not just an art project. There are many other fashion brands that have scaled while keeping their promise intact. This is just a sampling that serves to show success is possible at different ends of the market and with different products. If these brands seem similar it’s because they have all figured out how to build thriving businesses that balance the creative and the commercial. It should be clear the success in the fashion world requires meticulously controlling this tension. It’s incredibly hard, but it’s entirely possible. In Part IV, we’ll explore a new framework for keeping a brand’s promise as it scales internationally.